AMMO Worm, Earn & WIN!. AMMO Worm, Earn & WIN! 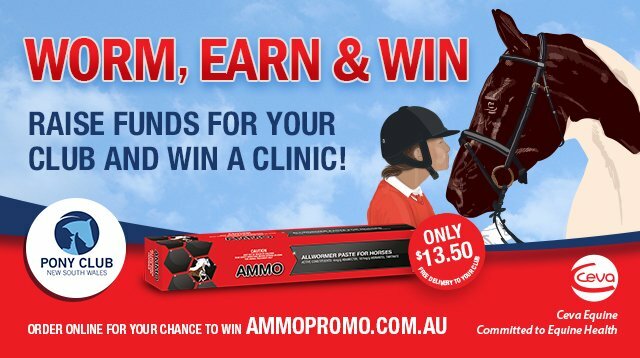 Purchase an AMMO Allwormer to raise funds for your Pony Club AND be in the running to WIN a professional coaching session at your club! 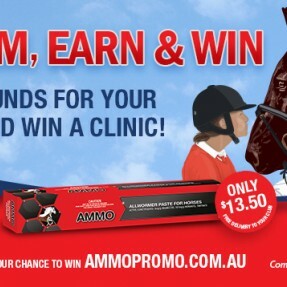 All Clubs in NSW will have received their special packs about the AMMO Worm, Earn and Win Program! This fantastic competition allows members to keep their horses healthy and feeling great, while also giving the Club an opportunity to raise funds and win some awesome coaching! 4. Every purchase gives you the chance to WIN a coaching clinic at your Club with Stuart Tinny, Dave Cameron or Gina Montgomery!